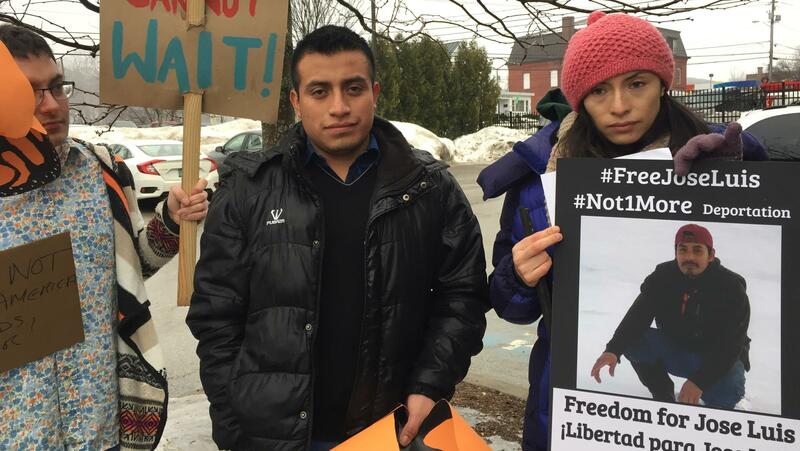 Victor Garcia Diaz, left, and Zully Palacios Rodriguez, at a recent demonstration in Richford, Vt. They are two of the undocumented Migrant Justice leaders arrested by ICE. They say many of the activists who are undocumented don't have criminal records and only came to the attention of Immigration and Customs Enforcement because of their activism. See the list of the 20+ immigration activists arrested here. "We're always at the marches and giving interviews, without fear of what could happen," says Zully Palacios Rodriguez, one of the activists caught by ICE. "So to go against us is a way to intimidate the community." Several of the arrests have garnered national and international attention. Two of the undocumented activists who have been arrested and put in deportation proceedings have filed First Amendment lawsuits claiming their free speech rights have been violated. In one of those cases, the United Nations Office of Human Rights waded into the controversy, calling on the U.S. government "to guarantee that no action, including detention and deportation, as a means of retaliation, is taken against" the activist. One of the groups crying foul is Migrant Justice, a nonprofit that advocates for dairy workers in Vermont. Six of its undocumented leaders have been arrested and face deportation. At a recent protest against ramped-up deportations under President Trump, a dozen demonstrators stand amid piles of dirty snow in the town of Richford, Vt., not far from the Canada border. "Not one more! Not one more!" they chant. Palacios is 24, from Peru, and undocumented. As a high-profile spokeswoman for Migrant Justice, she thinks that's why they targeted her. Wearing a pink knit cap pulled down against the cold, she steps up to speak in Spanish into a microphone. "I, too, am a victim of attacks by ICE," she says. Palacios and another prominent Migrant Justice leader, Enrique Balcazar Sanchez, were arrested a year ago when driving away from the organization's headquarters in Burlington. ICE agents had taken down their names during an earlier arrest of another colleague. The agents investigated and learned that Palacios had overstayed a student visa, and that Balcazar had entered the country illegally from Mexico to work on dairy farms. Neither Palacios nor Balcazar have criminal records. "There are six cases in particular where it's quite clear that the cause of the arrest was because of the members' leadership in the organization," says Will Lambek, national spokesman for the organization. He ticks off reasons he believes the leaders were targeted. During one arrest, he says, federal agents warned that they'd be back to apprehend another Migrant Justice director. In another arrest, ICE noted in the charging document that the subject — who had a DUI conviction — is "a member and associate of Migrant Justice, a local immigrant advocate group." ICE flatly denies that activists from Migrant Justice and other pro-immigrant groups are being singled out. "ICE does not target unlawfully present aliens for arrest based on advocacy positions they hold or in retaliation for critical comments they make," Matthew Albence, executive associate director for ICE Enforcement and Removal Operations, said in a statement. "Any suggestion to the contrary is irresponsible, speculative and inaccurate. "All those in violation of the immigration laws may be subject to arrest, detention and ... removal from the United States." In an email to NPR, an ICE spokesman for the region that includes Vermont, wrote: "Professional activists string together tenuous pieces of information to justify their campaigning. The allegations are just wrong." Doris Meissner, commissioner of the Immigration and Naturalization Service under President Clinton and now senior fellow at the Migration Policy Institute, is skeptical that immigration agents would be picking on activists. She points out that Trump has given ICE broad new authority to apprehend anybody they come across who's in the country unlawfully. "Activists can be swept up in that, just like a variety of other groups that have been unprepared to face deportation," she says. Yet, immigrant advocates point to what they call the hostile posture the administration has taken toward anyone standing in the way of its immigration clampdown. "It's all of a piece with what this Homeland Security Department has been doing around the country," says Omar Jadwat, director of the ACLU Immigrant Rights Project. "You have the attorney general, the secretary of homeland security, and the acting director of ICE all making various threats to sanctuary cities and their officials." He says it's not a stretch to think immigration agents would target anti-ICE activists who are in the country illegally. Among the other cases of immigrant activists facing deportation is Maru Mora-Villalpando, who came from Mexico City to San Francisco in 1996 on a tourist visa, and overstayed. Villalpando became a well-known activist in the Northwest, regularly speaking out against ICE's detention policies. ICE agents say she came to their attention when they read about her in the media accounts that indicated she was undocumented. In December, ICE sent her a letter telling her to appear before an immigration judge to face deportation. She didn't have a criminal record. In her charging document, an ICE agent wrote: "It should also be noted that she has extensive involvement with anti-ICE protests and Latino advocacy programs." The case came to the attention of the U.N. human rights experts. They wrote in a statement: "Ms. Villalpando's notice to appear at deportation proceedings, received without warning, seems to be related to her advocacy work on behalf of migrant detainees." "My first sense was that ICE was trying to send me a signal to stop my work," Villalpando says from her home in Bellingham, Washington. "The public needs to know what's going on." On Thursday, Villalpando appeared in immigration court in Seattle to make her case before a judge. Villalpando also has a First Amendment lawsuit pending. The other suit was filed in the case of Ravi Ragbir, director of the New Sanctuary Coalition of New York City. He was taken into custody during an ICE check-in in January. ICE says he's in the country illegally, and he was once convicted of wire fraud. But that crime was 17 years ago. And they put him into deportation proceedings two months ago. Immigration groups also point to eight members of a humanitarian group in Tucson called No More Deaths being charged with federal civil violations, such as entering a national wildlife refuge without a permit, and operating a motor vehicle in a wilderness area. They are not undocumented immigrants. They are volunteers from all over the country who leave jugs of water in the desert for immigrants crossing the border illegally. Arrests of Vermont dairy workers began in the Obama years, and they've accelerated under Trump's immigration crackdown. At the Richford protest, Balcazar, the Mexican immigrant arrested with Palacios, says the apprehensions of Migrant Justice leaders have sent a fresh chill through the immigrant community. "They prefer to keep quiet," he says. "They don't come out as much to our meetings and demonstrations. They prefer not to expose themselves and risk deportation." Indeed, the only Migrant Justice members to attend the meager protest at the health clinic were the leaders who'd already been arrested. Since its founding nine years ago, Migrant Justice has grown into a formidable advocate for the undocumented in Vermont. They pushed for drivers licenses for immigrants, and recently convinced Ben & Jerry's to improve working conditions in dairies. At a recent city council meeting in tiny Winooski, Vt., you could witness the influence they wield. Balcazar drove here straight from the health clinic protest. "We want to live in safety," he says to the council members. "We're often forced to live in the shadows. We don't trust the police." His organization wants to build on the success it has had on the state level. Migrant Justice was a major player behind the scenes when the Vermont Assembly passed a law last year that restricts local police from cooperating with federal immigration authorities. Some now consider Vermont a sanctuary state. On this night, activists and citizens have come to convince the city council to pass an even stricter ordinance to stop local police from dealing with ICE. They found a receptive audience. "We are not going to utilize City of Winooski resources to grant access to those individuals who are in our custody to immigration enforcement authorities," says Councilor Eric Covey. At the end of the public comments period, the council votes unanimously to adopt the measure proposed by Migrant Justice and the ACLU of Vermont.